(Nanowerk News) Most magnetic materials have a structure that is somewhat more complicated than a commercially available domestic magnet: they not only have a north and south pole, but a variety of sectors, often only a few nanometres in size, in each of which the magnetic axis points in a different direction. These sectors are referred to as domains. Over the past few years, Manfred Fiebig, Professor for Multifunctional Ferroics at ETH Zurich, has been studying the walls between adjoining domains in certain materials. "The inner workings of a material and its domains are one area of interest," says Fiebig. "However, fascinating things also take place at the boundaries of these domains." In this work, Fiebig has devoted himself to a very special class of materials: oxides - specifically those with multiferroic properties. 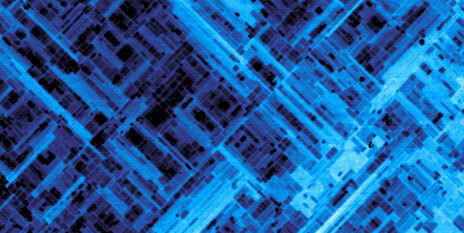 These are crystalline materials that are magnetically ordered (i.e. they have a magnetic north and south pole), but at the same time also exhibit an electrical order (that is, the electric charge in the material is distributed so that in addition to the magnetic poles, there are also positive and negative electrical poles). "That fact that magnetic and electrical ordering occur alongside one another in multiferroic materials means that cross couplings are also possible; for example, the magnetic state can be changed using an electrical voltage," explains Fiebig. These properties make the materials interesting for many applications and are the main reason why they are being researched so intensively by the scientific community. Together with his fellow researchers, Fiebig has closely studied the domain boundaries in certain multiferroics and recently published two articles on the topic. Here, the scientists showed that the electrical conductivity of the domain walls differs from that of the material as a whole. In one material, strontium manganite, they showed that the domain walls suppress the flow of electric current. "A material with non-conductive walls in a conductive environment could be very useful in the field of electronics," says Fiebig. For example, it may be possible to produce electronic components in which the nanoscale domains act as tiny capacitors that could be electrically charged separately. "This could be used to create a new charge-based storage medium," says Fiebig. It would take only a voltage pulse to alter the charge in a domain, he adds; a current flow would not be necessary. A storage medium of this type would be more energy-efficient than those available today. In addition, as the data storage would not produce any waste heat that would then need to be dissipated, much smaller storage media could be built. The paper was co-authored by scientists from Fiebig's research group together with scientists from the group under ETH professor Nicola Spaldin and from the University of Zaragoza. Spaldin and her colleagues contributed the theoretical explanation of why the domain walls are not conductive in strontium manganite. Fiebig explains that as crystalline materials never have a perfect structure, individual oxygen atoms will be missing at certain points in the oxides' crystal lattice. The scientists have now been able to show that these 'oxygen vacancies' accumulate preferentially at the domain boundaries, where they block the flow of current. In studies of a second multiferroic material, terbium manganite, scientists from Fiebig's group worked with colleagues from Japan to show that the domain boundaries could also be shifted using electrical fields under certain conditions. "This is an advantage over conventional semiconductor materials, which have a mature, fixed structure," says Fiebig. Furthermore, the researchers found conditions under which it was possible to change the magnetisation of the domains and the conductivity of the domain boundaries without changing the position of the boundaries. The prerequisite for these studies is a technique that makes the domains and their boundaries visible. This is currently possible only with a specific optical method known as second harmonic generation, where the material is irradiated with a very intense, pulsed laser beam in a specific colour. In response, the material emits light of a different colour, from which the scientists can obtain information on the magnetic and electrical structure of the material. Over the last few years, Fiebig has been the driving force behind the development of this optical method to study the internal order of materials. The fact that it is now possible not only to see the domain walls in a multiferroic, but also to selectively shift them or alter their conductance paves the way for new technical possibilities. Although Fiebig makes clear that specific applications are still a long way off, the findings may in future be used not only in data storage, but also in sensors or complex electronic components. "If you can alter the conductance in a material, you have got a switch - in our case, a switch that you can control without moving anything mechanically and which is therefore not subject to material fatigue," says Fiebig, who is now already thinking about the next step in development. At the moment, the magnetic state can be altered with an electric field. In future, he says, it may be possible to dispense with the electric field and switch the state entirely optically by using the intense light pulses not only to make the internal structure visible but also to simultaneously change it.